Want to host a holiday cookie exchange this year? If you enjoy planning parties, or rounding up friends and family for a get-together, a cookie exchange is a fun and low-key way to celebrate the Christmas season. Plus, going to a cookie exchange will allow you to serve a platter of assorted homemade cookies at your Christmas dinner—even though you only baked one type of cookie! If you’re interested in planning a holiday cookie exchange this year, read on for the simple steps to make it a success! 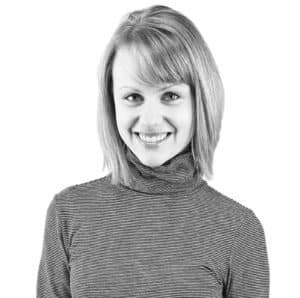 I’ll outline everything you need to know—from inviting guests through the details after the party. (Don’t worry—we’ll keep it simple!) Enjoy! Before I provide the details of how to plan an exchange, let’s talk about what it is! A cookie exchange is a party! 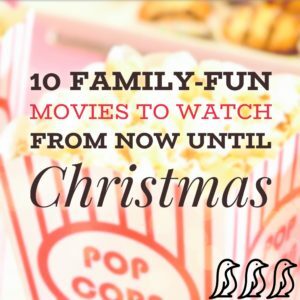 More specifically, a party where friends or family members gather to swap their favorite holiday cookies (or cookie bars, bark, truffles, etc.) and the coordinating recipe. Each guest only needs to bring one type of cookie, and they will leave the swap with a variety of other homemade cookies from the other guests! It is a great way to simplify the time you spend baking for the holidays, benefit from others’ creativity, and try new treats! Do I want each person to bring cookies “wrapped” (such as in a festive treat bag), or unwrapped (single cookies displayed on a decorative platter or in a large container)? Feel free to tweak these “rules” to work best for you and your guests. Send invitations out 1-2 weeks before the party. You can use paper invitations or online invitations, such as Evite.com or even a Facebook event. Aim for 5-10 guests; the larger the group, the more likely each person may feel overwhelmed by bringing enough cookies to share. How many cookies to bring: If you invite 5 guests, instruct them each to bring 5 dozen of their favorite cookie. If your group is larger, you may want to lower the amount to half a dozen cookies per guest. Also mention that, after swapping, they will leave with the same amount of assorted cookies! RSVP cookie type (optional): If you prefer to avoid having duplicate recipes at the party, ask guests to RSVP ahead of time with the type of treat they plan to bring. Communicate this information to all guests as soon as possible before the party. 3. Prepare for the party. Decide on a few simple party drinks and appetizers to serve during the exchange. Hot cider or coffee, and sangria or wine work well. Think savory foods, since guests will most likely be sampling the sweet treats while they swap them! Several days before the exchange, gather supplies, such as gallon-sized zip-top bags for taking cookies home, cling wrap or aluminum foil, blank cards and a marker to create tent labels to identify each guest’s cookies (such as “sugar cookies by Kate”). Decide which tabletops or countertops you’ll use to place guests’ cookies (and matching recipes). During the exchange, have each guest walk around and gather the appropriate number of cookies to take home, along with each recipe. Thank everyone for coming! Evaluate what worked well and what you might want to do differently, if you plan to host another exchange next year. You may also want to combine all the recipes into a document to email to each guest. 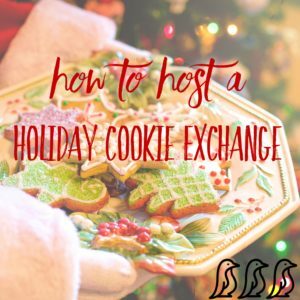 Now you understand what a cookie exchange is, and how to host your own swap! While the holiday season is often a stressful and busy time of year, a cookie exchange is one way we can simplify the tradition of holiday baking while enjoying a fun gathering with loved ones at the same time! Happy Holidays! If you have a favorite holiday cookie (or other treat) recipe and want to join my Virtual Holiday Cookie Exchange, please visit SimpleSaverWife.com and submit your recipe by December 14. Your recipe will be featured in a special post on December 17! Every Valentine’s day, my kids love getting to hand out cards to all of their classmates at school, which gave me the idea of handing out small, simple holiday cards to their classmates as well! 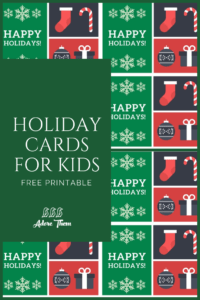 I put together this holiday card printable as a simple way for your kids to spread some holiday cheer! Sitting around the dinner table can be boring for kids, but conversation starters can be a great way to keep them engaged & entertained! These prompts are also fun for adults & older kids, & it is an easy way to bond, laugh, & learn more about each other. 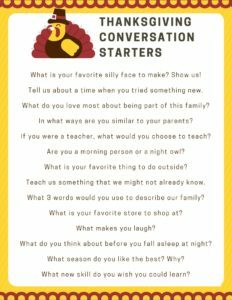 You can print out multiple copies of this free Thanksgiving conversation starters printable to hand out to your guests, you can cut out the questions individually into strips, you can use these questions as a starting point & then have everyone write down their own conversation starters, etc… Get creative & have fun!